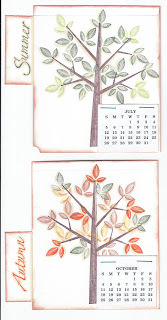 I have always loved the Season by Season set from Stampin' Up and was able to incorporate it into this full calendar by breaking up the seasons on the Calendar (Winter - Jan thru Mar; Spring - Apr thru Jun; etc.). 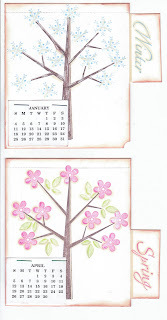 And, by using the Season of Friendship set also from Stampin' Up broke up each page with its own tree and calendar. 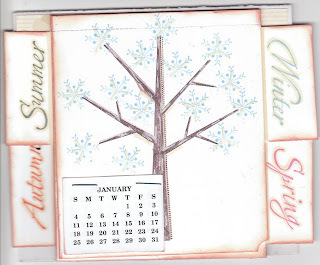 Then by labeling each season on the sides, created the full calendar. I did a perforated piece on the top of each page with my Cutterpede perforation wheel, when each season passes and the three months have passed, you can just tear off each page and you're ready for the new season. I adhered each page to each other using double stick tape above the perforation. All of this is set onto the backing of a Mat Pack backing for strength and which also enables the calendar to rest on the folded back and set on your desk. I'm very pleased with the way this came out and will probably give it to my boss for his 2009 calendar in his office. Thank you for stopping by and I'll have more calendars later (maybe even today). I'm staying inside as it is freezing outside!